There had been another awards ceremony staged in Los Angeles less than 24 hours earlier, a more sober, less convivial affair than this SJA dinner at The Brewery. But it did not take long on the night in London for someone to dub these awards the Oscars of sports journalism. With television coverage (from Sky Sports), reports on the following morning’s Today programme on Radio 4 and video messages sent in from Chittagong to Manchester, the 2009 SJA British Sports Journalism Awards, sponsored by UK Sport and Sky Bet, had many of the trimmings associated with a glitzy Hollywood movie event. To stretch the analogy beyond breaking point, the Oscar for best pictures went to Action Images’ Scott Heavey, while best direction was won by the Daily Telegraph, whose team took the prize for their Ashes coverage. And, on a night when last summer’s gripping Ashes series provided the source material for many of the awards, the Oscar for best sports writer in a leading role was won, for the first time, by Michael Atherton, the former England captain, now Times cricket correspondent. To ensure that this awards night matched any other, there was also a lifetime achievement award, the SJA’s Doug Gardner Award for services to sports journalism and the SJA, which was presented by the SJA President, Sir Michael Parkinson, to Hugh McIlvanney. 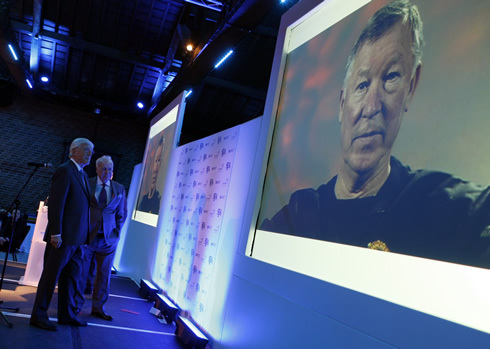 McIlvanney, now with the Sunday Times, has six times won the SJA’s Sports Writer of the Year award, but he was chosen for the Doug Gardner honour for a career that has spanned nearly 50 years, a fact acknowledged with a special video message from the Manchester United manager, Sir Alex Ferguson. Atherton was acclaimed as Sports Writer of the Year following a poll of national newspaper sports editors conducted by the Sports Journalists’ Association, who have organised the awards since 1976 – when McIlvanney was joint winner with the late Ian Wooldridge. Atherton’s award capped off an evening dominated by coverage, in reports and pictures, of last year’s Ashes cricket series. “peerless on his own sport, entertaining, throught-provoking and challenging on any other subject”. “his elegant style, thoughful but incisive opinions were, in an Ashes-winning year, indispensable”. Atherton was also named Sports Columnist of the Year by a panel of distinguished judges from all sections of the sports media, he was highly commended in the Specialist Correspondent category, and he took some credit for his commentary work as Sky Sports’ Test cricket coverage won the TV Sports Programme award. Atherton played 115 Tests for England, 54 as captain, and scored 7,728 runs before retiring to the Press Box at the end of the 2001 Ashes series. He is the first former sportsman to win the award. He was 5,000 miles away in Chittagong covering England’s cricket tour of Bangladesh, but sent a video message of his own, apologising for his absence and chiding the “chiefies”, such as others short-listed for the award, Ollie Holt and Paul Hayward, for inexplicably missing out on this cricket tour, having been devoted to covering last summer’s internationals against Australia. 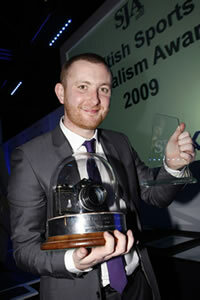 Runner-up to Atherton as Sports Writer of the Year was Hayward (Observer) with David Conn (The Guardian) third. Expertly compered by Jim Rosenthal, this was a night of firsts for these prestigious awards which now encompass writers, broadcasters, photographers and cartoonists. It was the first time in the awards’ 33-year history that Private Eye, the satirical magazine, featured among the winners, their Premiersh*ts strip won Paul Wood the Cartoonist of the Year prize. It was the first time that these awards had been covered “live” on Twitter, with former Liverpool, Forest and Villa striker Stan Collymore, now a TalkSport pundit, John Stern, editor of Wisden Cricketer magazine, and SJA secretary Steve Downes all sending out messages replete with hash tags and no more than 140 characters. It was also the first time that the SJA had included four broadcast awards – programme and broadcaster, in radio and television. All voted for by the SJA membership, it saw BBC cricket correspondent Jonathan Agnew twice visit the stage, for the radio broadcaster award and on behalf of Test Match Special for radio programme. Cricket also drove the TV programme award, with another former England captain, Nasser Hussain, collecting that on behalf of Sky Sports’ coverage. “They sent me because this is the first time I’ve won anything to do with the Ashes,” he said. The TV broadcaster was a familiar figure, Sky’s Jeff Stelling winning for the fifth year. The Sports Photographer of the Year award resulted in a “photo-finish” with the judges finally giving the decision to Heavey ahead of Toby Melville of Reuters, the first time that an Action Images photographer has scooped first prize. Sports picture of the year went to an image by PA Sport’s Gareth Copley which captured a tense moment in the Ashes series for England batsman Jonathan Trott. “a joy to read. Informative, witty and honest”. “moving and compelling interviews, strong comment and excellent match reporting”. That award was collected by Winter’s sports editor, David Bond, who explained that his dedicated writer was, at that moment, reporting on the latest Liverpool defeat. On a good night for the Daily Telegraph, Oliver Brown was judged Young Sports Writer for a second time, to go along with the Team award for its Ashes coverage. Of this year’s new categories the Daily Mail’s cricket writer Lawrence Booth won the online award for a Regular Blog or Column, while the BBC’s Tom Fordyce took the Live Blog section. Live Blog: Tom Fordyce (bbc.co.uk). Highly commended: Rob Smyth (guardian.co.uk). Cartoonist: Paul Wood (Private Eye). Nick Newman (Sunday Times). Radio Programme: Test Match Special (BBC). Runner-up: 5Live Sport (BBC). Feature Writer: Owen Slot (The Times). Highly commended: Donald McRae (The Guardian). TV Programme: Test match cricket (Sky Sports). Runner-up: Soccer Saturday (Sky Sports). Regular Blog or Column: Lawrence Booth (dailymail.co.uk). 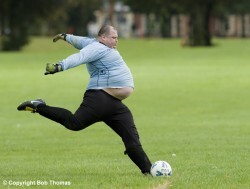 Highly commended: Edward Gorman (www.timesonline.co.uk). News Reporter: David Conn (The Guardian). Highly commended: Paul Kelso (Daily Telegraph). Specialist Correspondent: Henry Winter (Daily Telegraph). Highly commended: Michael Atherton (The Times). Young Writer (the Ian Wooldridge Trophy): Oliver Brown (Daily Telegraph). Highly commended: Laura Williamson (Daily Mail). Sports Story: Paul Kelso (Daily Telegraph – “Bloodgate”). Highly commended: David Conn (The Guardian – “Hillsborough cover up”). Betting Writer: Steve Palmer (Racing Post). Highly commended: Derek McGovern (Daily Mirror). Columnist: Michael Atherton (The Times). Highly commended: Oliver Holt (Daily Mirror). Interviewer: Donald McRae (The Guardian). Highly commended: Matt Lawton (Daily Mail). Radio Broadcaster: Jonathan Agnew (BBC). Runner-up: John Inverdale (BBC). TV Broadcaster: Jeff Stelling (Sky Sports). Runner-up: Clare Balding (BBC). Team of the Year: Daily Telegraph – The Ashes. Highly commended: Guardian and Observer – The Ashes. Sports Writer of the Year: Michael Atherton (The Times). Runner-up: Paul Hayward (Observer). Third: David Conn (The Guardian).